Watanabe calendars feature the artwork of Sadao Watanabe (1913–96), a renowned Japanese Christian print artist. The print for this year’s calendar, “The Good Shepherd,” was created in 1982. Calendars are $30 each and the proceeds go to the William J. and Elizabeth M. Danker Fellowship for International Students at the Lutheran School of Theology in Chicago. The calendars, on momigami (wrinkled paper) or washi (Japanese paper) and featuring Watanabe’s colorful art, are 16.5 by 23 inches. 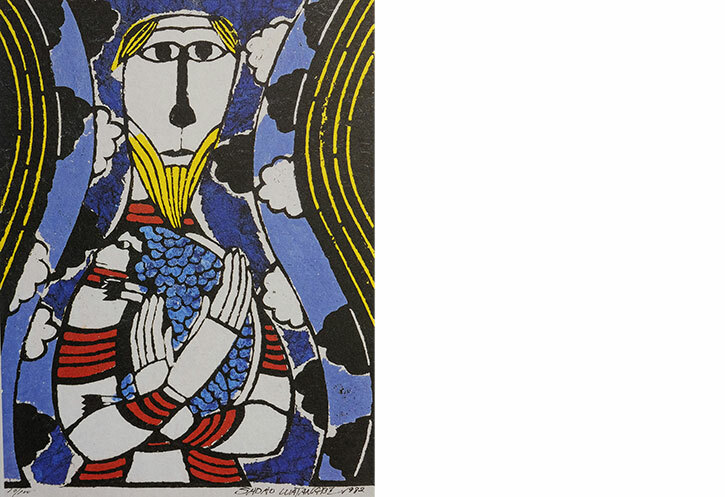 Using the traditional Japanese folk art of stencil dying, or katazome, Watanabe created colorful representations of biblical scenes that he hoped would speak to his people. He clothed all the biblical characters in the Japanese dress of kimonos, making him less concerned with representing visual reality and more concerned with finding ways to communicate his Christian beliefs to other Japanese. His desire was to create art that could be enjoyed by common people and displayed in ordinary settings. The Danker Fellowship honors the couple’s legacy of helping international students prepare for ministry. The Dankers served as missionaries in Japan and were founding supporters of the Center for World Christian Interaction dedicated to helping international students become pastors and church leaders in their home countries. Recent Danker Fellowship recipients came from Thailand, South Korea, India and Nigeria. To purchase a calendar please use the form below or contact advancement@lstc.edu or call 773.256.0757. The calendars are $30 apiece, which includes shipping and handling. If you prefer to pick up the calendars at LSTC (M-F, 9 a.m. to 4 p.m., room 231), the cost is $25 apiece.